In 1849, the Lower East Side became home to the German Jewish immigrants immediately after the failure of the socialist revolution of 1848. The newly formed Congregation, Ansche Chesed hired the German architect, Alexander Saeltzer to build a new synagogue. When it opened in 1849, it was the largest synagogue in the United States holding up to 1,500 worshippers. For a time, the synagogue thrived from 1886 until 1921. The synagogue was also home to Congregation Ohab Zedek. Followed by a Russian congregation, Anshe Slonim worshiped there from, 1921 until 1974. By 1974, the Slonim community had dispersed and the synagogue was abandoned and suffered vandalism. It was not until 1986, when the Spanish sculptor, Angel Orensanz was touring the area in hopes to find a studio space, that the building was re-introduced into the cultural world. Angel purchased the property and immediately began renovating the building by adding new floors, windows, and installing electricity. In late spring of 1986, he opened the space for an exhibition of his new work. People were immediately enchanted by the space. Since then, millions have come to, hear concerts, participate in weddings, and attend lectures, community events and holidays. 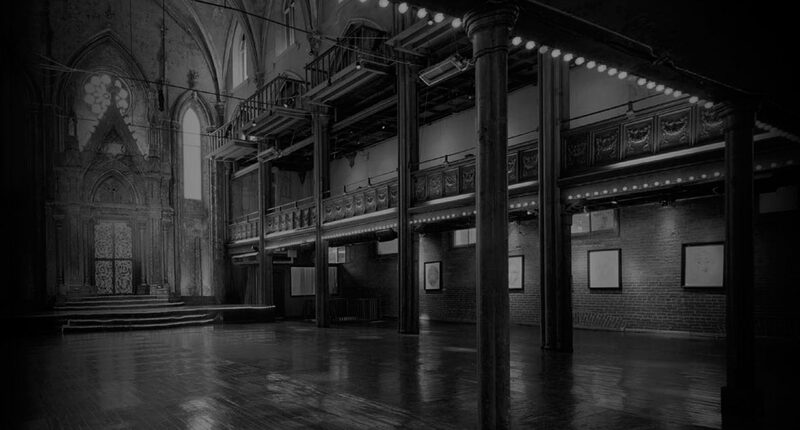 Today, the Foundation acts as both Angel Orensanz’s studio and as a center for the arts. The Foundation provides an intimate space to experience Angel’s work and an artistic and cultural resource for, artists, writers, thinkers and members of the surrounding community. Click here for the booklet "From Anshe Chesed to Angel Orensanz" written by Al Orensanz, Ph D.